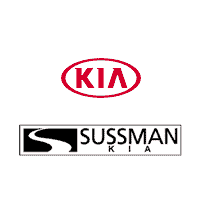 Sussman Kia knows you spend a lot of time in your car, which is why we want to help you find the right match for your lifestyle in Jenkintown, Rydal, and Glenside. We want you to drive a vehicle that gives you the dependability you need with state-of-the-art technologies to make your daily commutes more exciting. As you’ll see in this 2019 Kia Optima review, this car isn’t just another sedan. It offers sporty and efficient options, highly rated safety features, and a redesigned infotainment system. 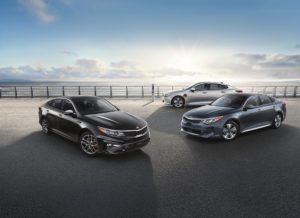 A standard 2.4L engine balances power and efficiency in the 2019 Kia Optima, delivering 185 horsepower with an EPA-estimated 25 city/35 highway MPG.1 However, depending on your preferred driving style, you may want to upgrade to one of the two turbocharged options. The EX, for example, has a 1.6L engine that’s paired with a 7-speed dual-clutch transmission. This model achieves an impressive EPA-estimated 27 city/37 highway MPG.1 The 2.0L in the SX, on the other hand, delivers 245 horsepower and 260 lb-ft of torque. Plus, this model comes with a sport-tuned suspension for more responsive handling. The 2019 Kia Optima also offers comfort and convenience upgrades for a more premium ride. Available heated and ventilated front seats keep you and your front passenger comfortable no matter what the weather is in Pennsylvania. You can also opt for two-tone sport seats in red and black leather for a more athletic, European style. Looking to finance? Contact the experts in our finance center to get started! Not only did the 2019 Kia Optima receive a 5-Star Overall Safety Rating from the National Highway Traffic Safety Administration, but it was also named a 2019 TOP SAFETY PICK+ by the Insurance Institute for Highway Safety (IIHS) when equipped with LED projector headlights. The 2019 Kia Optima is the first vehicle to come equipped with a restructured UVO infotainment system. This system, which you can control from an 8-inch color touchscreen display, is even more user-friendly than before. Standard Apple CarPlay™ and Android Auto™ capabilities allow you to easily connect your compatible smartphone to UVO Play, so you can make calls, use your phone’s navigation, listen to music, and more. Choose an Optima with UVO Link—standard on the S and EX models—to add more useful features, such as maintenance and speed alerts, vehicle diagnostic information, and SiriusXM® Satellite Radio capability. Plus, you have the option to remotely lock or unlock your car, sound the horn, and more with UVO Link. Finally, you can also upgrade to UVO link with navigation for an in-vehicle navigation system with personalized points of interest and twice-yearly map updates. 2019 Kia Optima: Schedule a Test Drive! If you’re considering the 2019 Kia Optima to take you across the roads of Jenkintown, Rydal, and Glenside, head to Sussman Kia to experience it for yourself. We’ll walk you through the models on our lot, explain the premium features, and walk you through the process of driving one home today. Contact us to schedule a test drive!